In Windows world Task Manager is included in OS. It is easy to use for basic troubleshooting and to kill hanged processes. But even the tool is powerful enough for everyday usage for further investigation or advanced use his abilities are simply not up to date. Microsoft acquired Sysinternals a years ago and continued to develop and improve their tools. Furthermore they are freely available. You can investigate each process – his threads, interrupts, devices, registry keys etc. 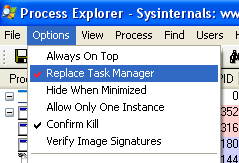 in addition it could be easily configure to replace TaskManager. If you are reading up to here you should be interested in the tool. Here is how to get it. Go and download the latest version from Sysinternals website. Unzip the downloaded file. c:\Program Files\ProcessExplorer is a good place.